The UWM Health Care Administration Program received the top program honor in the undergraduate category for the second consecutive year, recognized nationally by the American College of Healthcare Executives at the 2019 Congress on Healthcare Leadership. Joined by students, alumni, and faculty, Kathleen Olewinski, FACHE, received the award on behalf of the program. Congratulations to all! Linda Whittingham and Peter Dunn (Biological Sciences) were awarded the 2019 Elliott Coues Award from the American Ornithological Society (AOS). This is one of the highest awards in ornithology, recognizing outstanding and innovative contributions to the study of birds. This is outstanding award and well done, Linda and Peter! Michael J. Mikoś (Foreign Languages and Literature) has a new book out: Trifles, Songs, and Saint John’s Eve’s Song. Congratulations, Michael! Peck School of the Arts alumna Elora Hennessey (BFA ’17), also current UWM photographer in Integrated Marketing Communications, was named NEWaukeean of the week. The university, and Greater Milwaukee, are lucky to have her talents. Congratulations, Elora! Kudos to the UWM Libraries and CETL (Center for Excellence in Teaching and Learning) for leading the Open Textbook and OER Project to $1.3M in student savings and bringing textbook access to 11,500 students. This is a wonderful initiative in support of our students. Well done! Jonathan Hanes (OAIR and Geography) has been appointed Interim Director of the Office of Assessment and Institutional Research. Previously, Jonathan served as the Associate Director in OAIR where he was involved in a variety of efforts related to data analytics, data and report production, and institutional research. He also serves as an adjunct assistant professor in UWM’s Department of Geology. Jonathan earned his B.S. in Geography from UW-Stevens Point and his Ph.D. in Geography from UW-Milwaukee. Congratulations, Jonathan and I am looking forward to working with you! Molly Hassler (Center for Community-Based Learning, Leadership, and Research) was featured on Wisconsin Public Radio’s Central Time talking about UWM’s Student Artist in Residence Program, where students host creative workshops in elder care facilities in exchange for room and board. A big congratulations to Milwaukee student athletes, who continue to score high marks in the classroom, posting a collective 3.24 GPA during the Fall 2018 semester! This marks the 37th consecutive semester that Milwaukee student athletes have recorded a GPA of 3.0 or better, as well as the eighth straight with a 3.20 GPA or higher. During the Fall 2018 semester, 81 Panthers complied a GPA of at least 3.8, while 40 of those achieved a perfect 4.0! I start the day with my weekly meeting with Robin Van Harpen, followed by my monthly meeting with Kris O’Connor, and an External Strategic Partnerships meeting. Then, the Chancellor’s Executive Cabinet has a Deep Dive meeting, Paul Klajbor and I have a budget meeting with Robin Van Harpen, Drew Knab, and Cindy Kluge, I have my bi-weekly meeting with Mark Harris, and my weekly staff meeting. I end my day with a meeting with the Associate Deans. In the morning, I have standing meetings with Tom Luljak, Ray Fleming, Kim Litwack, and Kristin Roosevelt. The Distinguished Professors will also meet with the Chancellor and me. In the afternoon, I’ll meet with the University Committee, and have standing meetings with Alan Shoho, Pat Borger, and Bob Greenstreet. I’ll be in Madison for the UW-System Provosts meeting on Wednesday and Board of Regents on Thursday. I start the day making remarks at the Finance and Administrative Affairs Strategic Planning Retreat, followed by my standing meeting with Michael Doylen. I will also provide remarks at the International Teaching Assistants’ Annual Academic Seminar. Anna Maria Escobar (University of Illinois at Urbana-Champaign) presents, “Peruvian Colonial Spanish: Spanish and Indigenous Narrative Strategies,” on Wednesday, March 6 at 2 p.m. in the AGSL Library. There will be a formal election debate on Monday, March 11 from 5 – 8 p.m. in Union Ballroom East. Open Education Week is March 4 – 9. Faculty and instructors are invited to an introductory workshop about open educational resources and open textbook adoption on Thursday, March 7 at 3 p.m. in the UWM Digital Humanities Lab. Join the Center for Community-Based Learning for an information session to learn about paid, full-time positions with AmeriCorps and the Peace Corps on Monday, March 11 at 5:30 p.m. in Union 191. RSVP. The French program & Institute of World Affairs welcome Azouz Begag, sociologist, novelist & French Minister for the Promotion of Equal Opportunity: From Immigrant to Migrant — The Politics of (French) Hospitality, a conversation in English and in French with readings from his latest work. This event will take place on Monday, March 11, from 5:30 – 7 p.m., in the Golda Meir Library, Special Collections (4th Floor). Join us for our annual celebration of UWM alumni employees and their amazing contributions to the University. 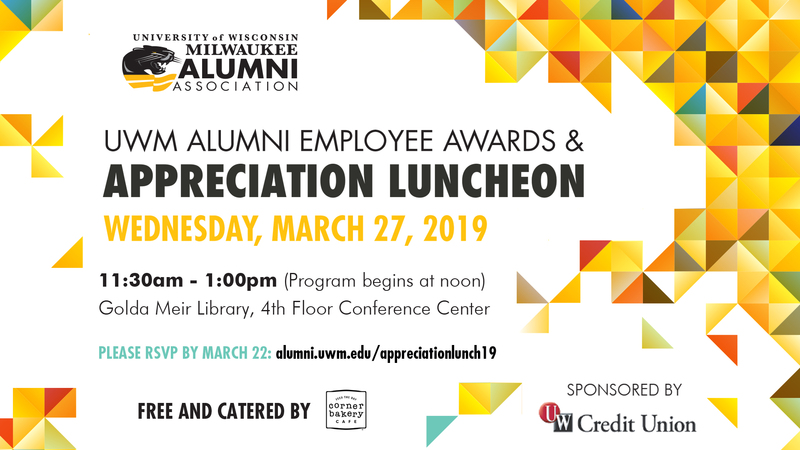 Nominees for the Alumni Employee Awards will be recognized, and winners announced at the luncheon, which will be catered by Corner Bakery and is complimentary for all attendees. The interactive presentation “Building Values-Based Classroom Communities at UWM” will take place on Friday, March 29 from 10 a.m. – 12 p.m. in the 4th Floor Conference Center of the Golda Meir Library. Drew DeLutio from Milwaukee Public Schools’ Office of Violence Prevention will lead the presentation. This event is free and requires an RSVP. MCTS is making changes to some of their routes on March 10, 2019. Roger Federer reached a momentous milestone on Saturday, winning his 100th singles title!